This 10 gram Gold Bar Lady Fortuna is manufactured by a premium bullion brand - the renowned PAMP Suisse. Struck from 10 grams of .9999 pure gold, this splendid gold bar, is part of the beloved Lady Fortuna series depicting the Roman goddess of chance and prosperity. PAMP Suisse, the prominent refinery located in Ticino, Switzerland, was founded in 1977. The mint quickly became popular due to its high-quality bullion bars and innovative bullion security features. 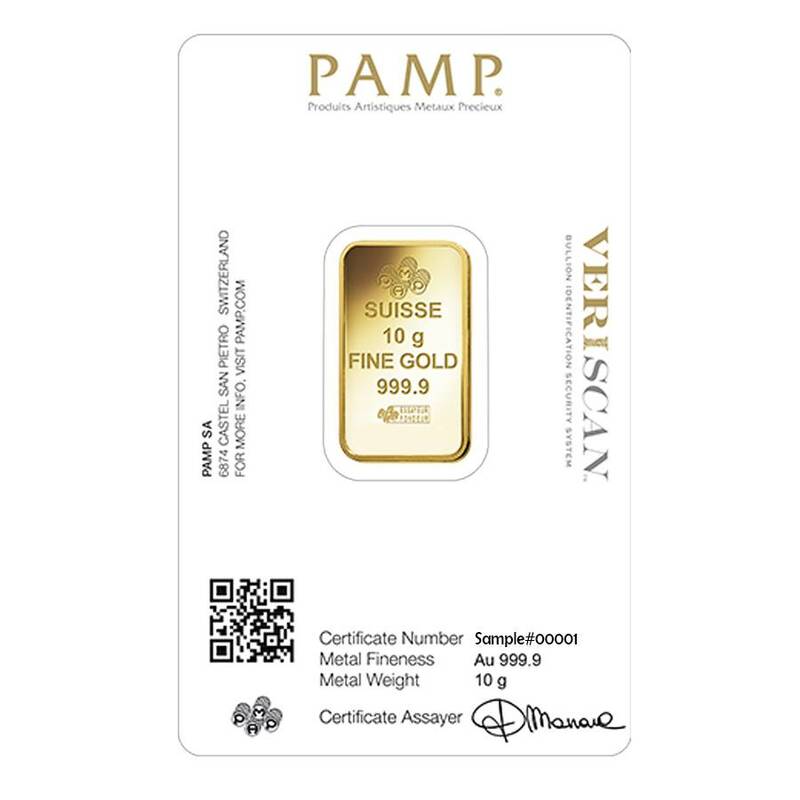 The latest technology adopted by PAMP Suisse is the Veriscan® measure - the innovative microscopic surface topography that acts as a digital fingerprint. 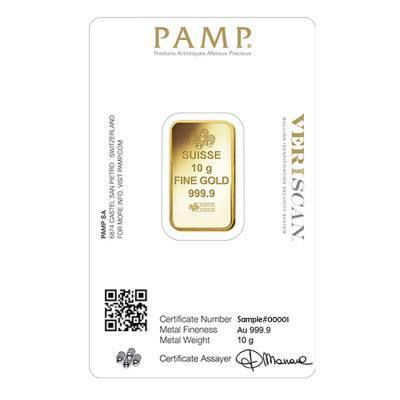 Using it, the bar is scanned and registered in PAMP's bullion database, and that can be accessed to confirm the bar's authenticity. The Mint's latest gold bars from the beloved Lady Fortuna series also contain this security feature. 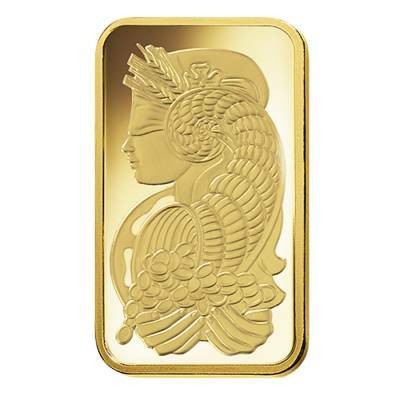 These stunning bars are manufactured from 10 grams of 99.99% fine gold and depict the popular Lady Fortuna image. Also called "Lady Luck," the Roman Goddess is engraved with a blindfold, symbolizing life's unpredictability, and sharing her overflowing wealth from the rich cornucopia. 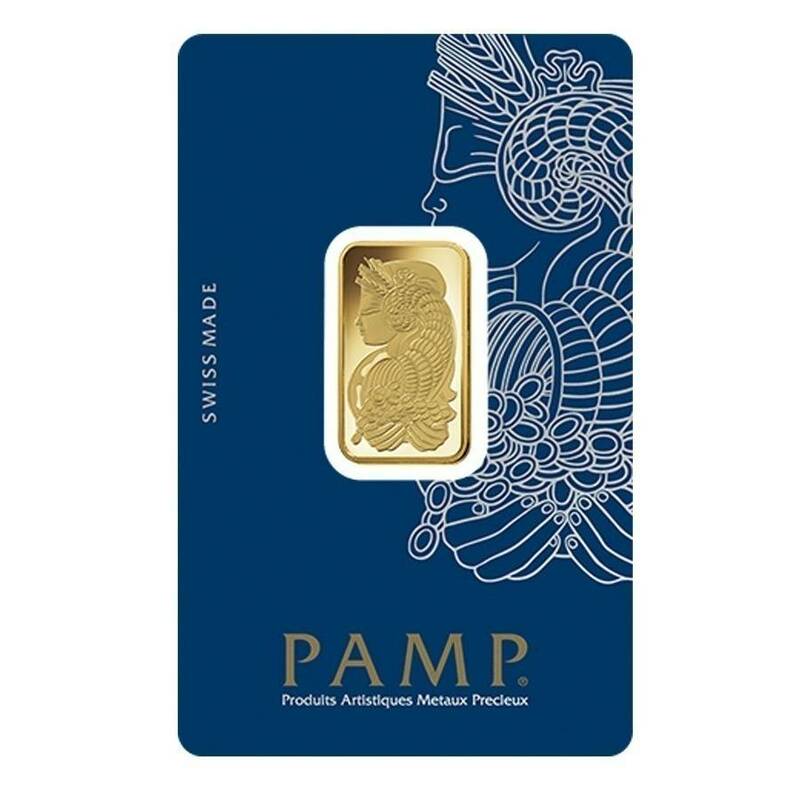 This 10 gram Gold Bar PAMP Suisse Lady Fortuna is an exceptional gift option and an excellent way to diversify your bullion portfolio. Made from 99.99% fine gold with a weight of 10 grams. Eligible for IRA and backed by PAMP Suisse. Sold in its original mint assay card. Contains the individual serial number. Displays the newest Veriscan® security feature - a particular microscopic surface topography that is attributed to each bar. This individual digital fingerprint is registered in PAMP's special catalog for further authentication. Obverse: Displays the famous image of "Lady Luck" - the Lady Fortuna. The Roman Goddess of fortune and chance is also considered the protector of grain supplies. Lady Fortuna is engraved as wearing a blindfold - the representation of the unpredictability of life. The Goddess is also holding her wealthy cornucopia and sharing its riches with others. 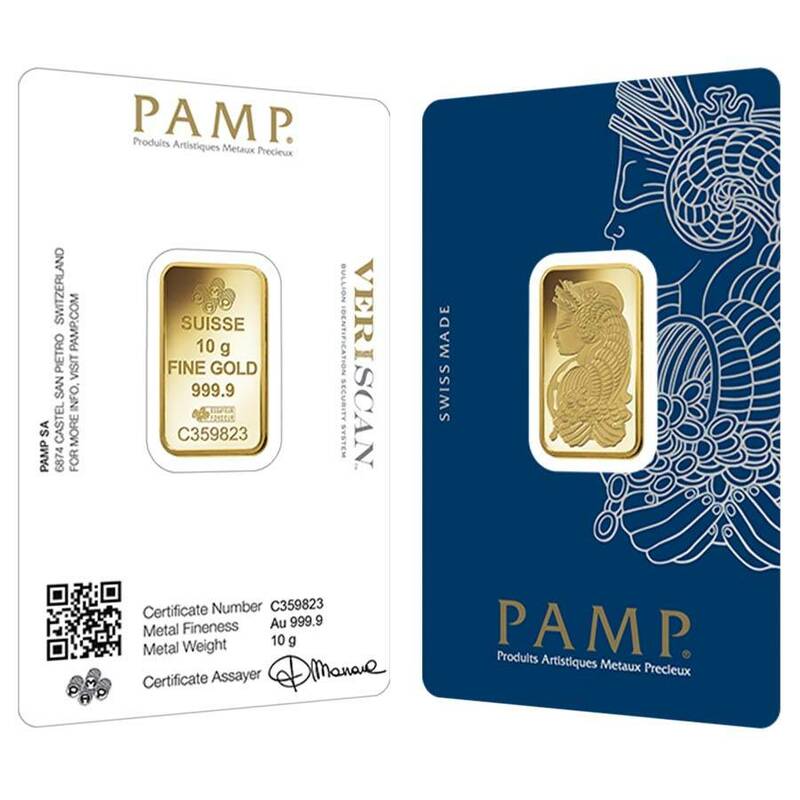 Reverse: Features the logo of PAMP Suisse, along with the inscriptions of weight and purity of the bar. The reverse side of the bar also contains the engraving that confirms the bar's authenticity - "Essayeur Fondeur" and the individual serial number. You can be sure that you will find only high-quality gold bars, here at Bullion Exchanges! Order this stunning bar and add it to your valuable investment portfolio, simply by clicking on "Add to cart." Get your bar safely wrapped and packaged to be shipped to you in no time! For any questions, all you have to do is contact us at 800.852.6884 or send us a message, and we will happily assist you. 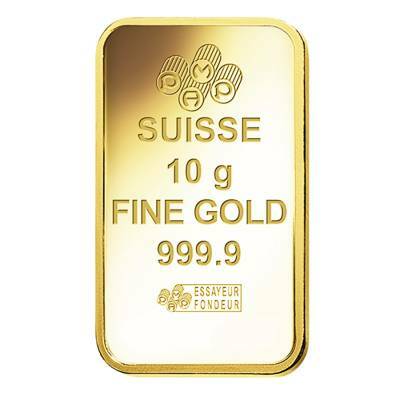 I am pleased with 10 gram Gold Bar PAMP Suisse Lady Fortuna. The bar arrived in brand new condition inside the assy. No evidence of tampering or that this is a fake. With VeriScan feature I think it will be easy to sell the bar when the time is right. Very helpful and friendly. Awesome customer service over the phone and through email. Was delivered earlier than expected and was packaged nicely and securely. Beautiful bar in addition! Great bar. Came in perfect condition. Great website! The ordered item was in perfect condition and these guys have really reasonable prices. This gold bar was delivered promptly, nicely packaged! That was my first purchase at Bullion Exchanges, next time I'll go with larger value bars. I like the tamper proof sealed package it came in. Nice design, and very attractive for a little bar. I also love the Lady Fortuna design from PAMP. A friend of mine got me into investing in precious metals. This was my very first buy and I am extremely pleased! I would recommend buying some of these to add to your precious metals investment! This item shipped fast, thanks for the great communication and excellent packaging! I will be returning to purchase more gold and silver! With this purchase, you earn 429 Bullionaire Bucks 429 BB = $0.43. We currently have 4591 of this item in stock.